From photo projects to nurse-ins, people work to support and empower breastfeeding moms in many ways. But the Virginia Breastfeeding Task Force's potential new initiative might be a first. The Virginia nonprofit has designed a breastfeeding-themed specialty license plate and is trying to gauge interest in the product. The plate features the international symbol for breastfeeding, along with the phrase "Building Bonds for Life." 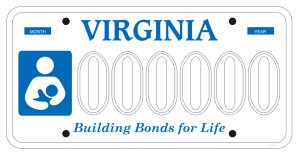 The Virginia Breastfeeding Task Force has not yet manufactured the license plates, but if at least 450 people commit to buying one, it's quite possible you could see these on the road someday.